Life at the Best Practices Center is often action-packed, and the third week of February was no exception! On Tuesday, I was at Oxford High School, facilitating an Instructional Round. 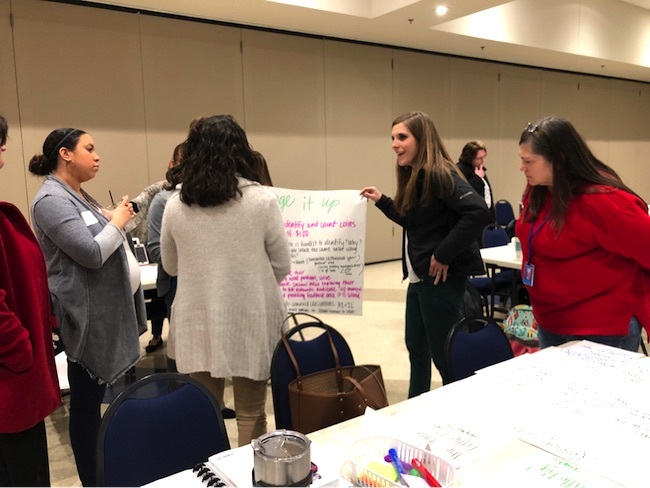 Oxford City Schools is one of the most innovative districts in the state, working to improve teaching and learning in all their classrooms every day. As I entered the building anticipating a great day of learning, I was in for a big surprise! 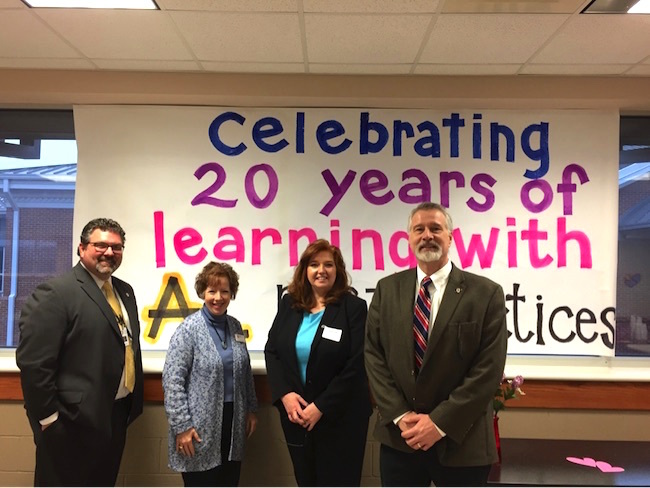 Oxford HS Principal Heath Harmon and his faculty decided to help the Alabama Best Practices Center celebrate our 20th anniversary with a banner and cake. 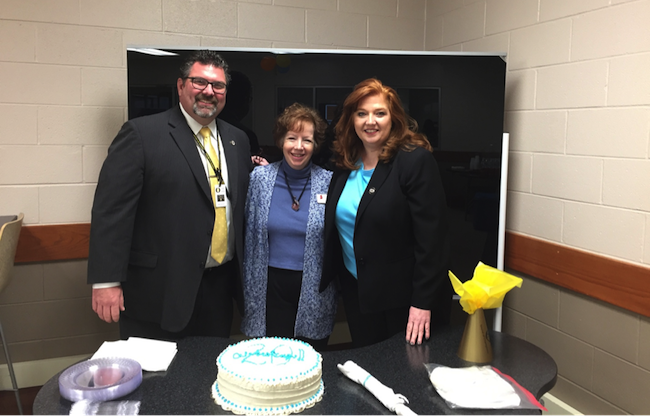 Later that morning, Oxford City Superintendent Jeff Goodwin and Director of Curriculum and Instruction Khristie Goodwin joined the celebration. You can read more about the Instructional Round process here. The “problem of practice” for the round at Oxford High School solidly focused on students. 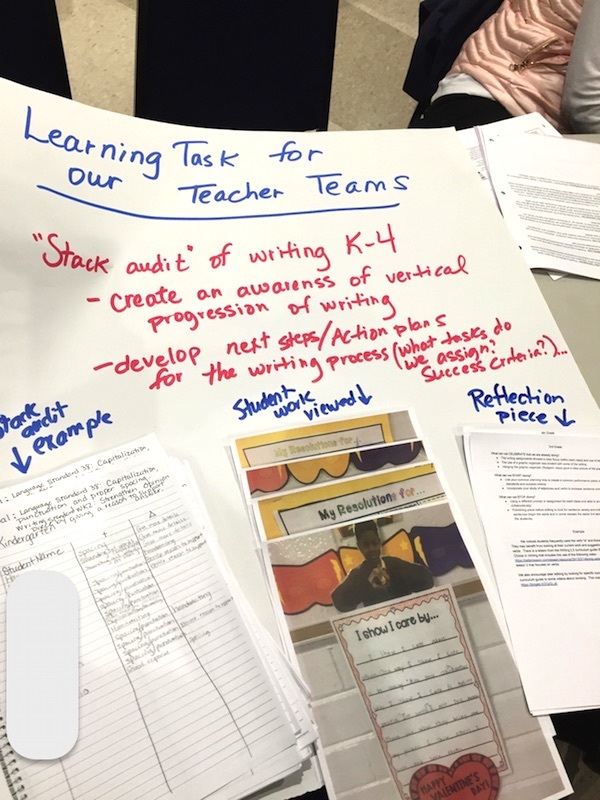 Our visiting team’s “look-fors” included: Can students provide observers with information about their current unit goal and how it relates to what they are learning that day? And the team asked students: How do you monitor your progress and how do you know if you are doing high quality work? 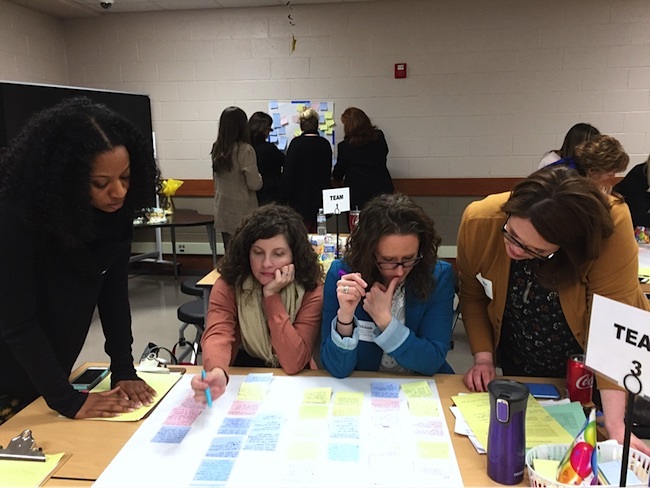 Before going to observe three classrooms, participants in teams of three of four educators speculated on what evidence they might be able to gather about the identified look-fors. 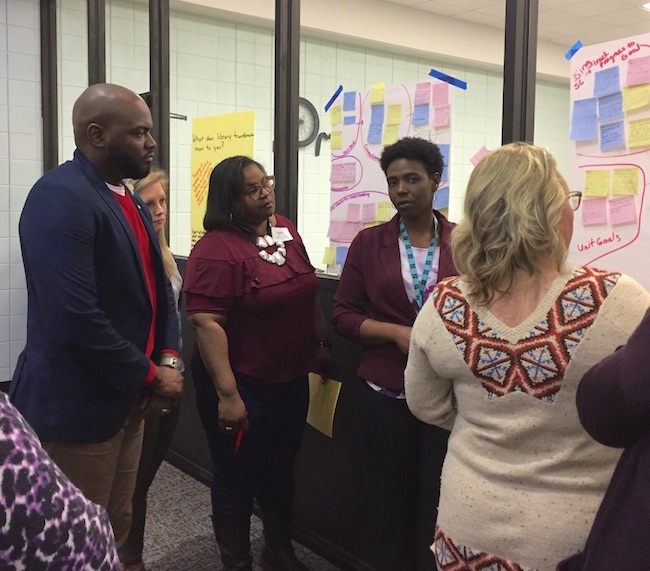 After visiting three classrooms, teams went to work compiling evidence and looking for specific categories using an affinity mapping protocol. 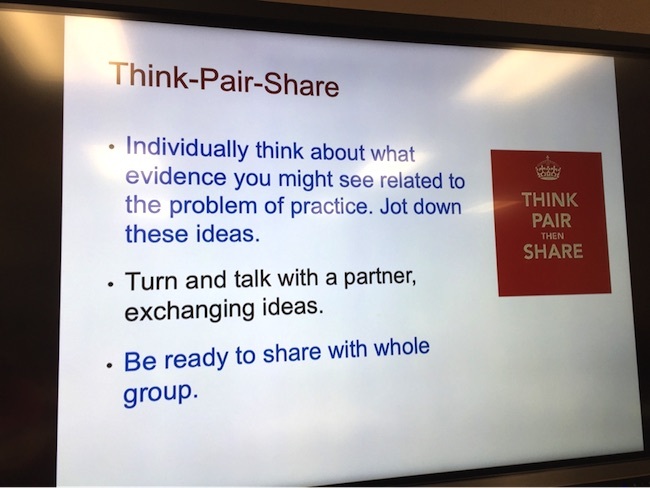 Next, teams were combined so they could compare and contrast the evidence gathered by both groups and identify patterns and contrasts. 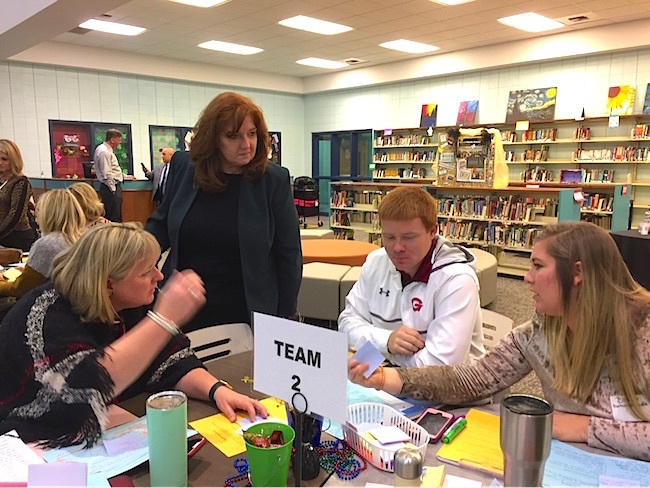 The combined teams also made predictions and surfaced questions for Oxford HS educators to consider as possible next steps. A gallery walk enabled all team members to look at the combined team’s patterns, contrasts, predictions, and questions. Another surprise awaited when I walked into Oxford Middle School the next day. 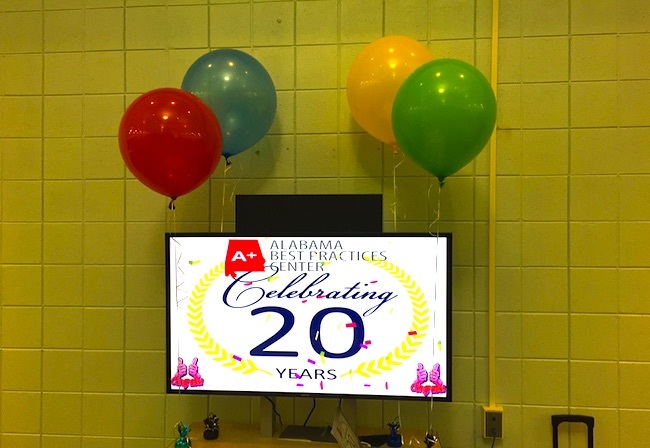 This time it was a beautiful screen slide created by OMS students and an abundance of helium balloons placed across the room to celebrate ABPC’s 20th anniversary! The focus area for Oxford Middle School’s Instructional Round was very similar to that of Oxford HS. And, from these photos, you can tell visiting participants took their role seriously as they gathered and compiled evidence. Team commendations for Oxford Middle noted the school was organized around learning and called attention to the presence of high expectations and consistency between classrooms. 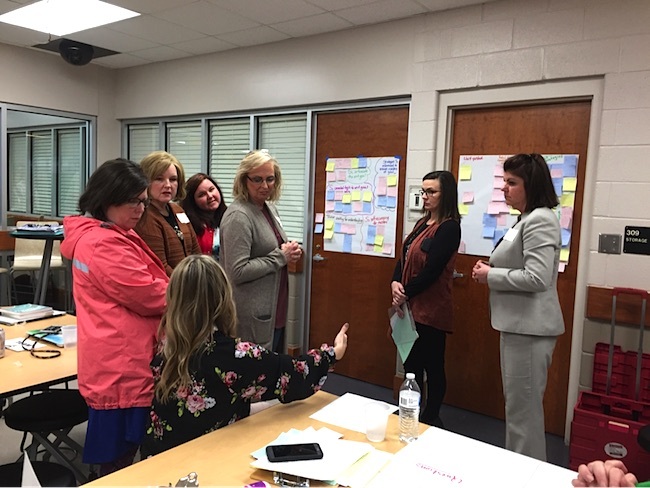 On Thursday, I was in Gardendale for the final elementary Powerful Conversations Network meeting of this school year. This year’s focus has been on “powering up” lessons to better engage students and ensure that they are well-prepared for the next level – be it in school, college, or life. We began the morning with a review of some of the major concepts of powerful task design using one of my favorite protocols, Concentric Circles. In the first step, half of the participants form a circle, facing outward. The remaining half of the participants then form an outside circle by standing in front of someone in the inside circle. The culminating event of the day was a Learning Fair, where participants shared what they have learned and used in the classroom as a result of their involvement in this year’s Powerful Conversations Network professional collaboration. 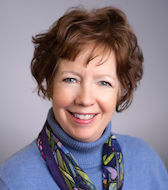 Walking around the “fair,” learning about the many products educators had created – and seeing and hearing the excitement in the presenters’ voices – reinforced the power and efficacy of ongoing professional networking. 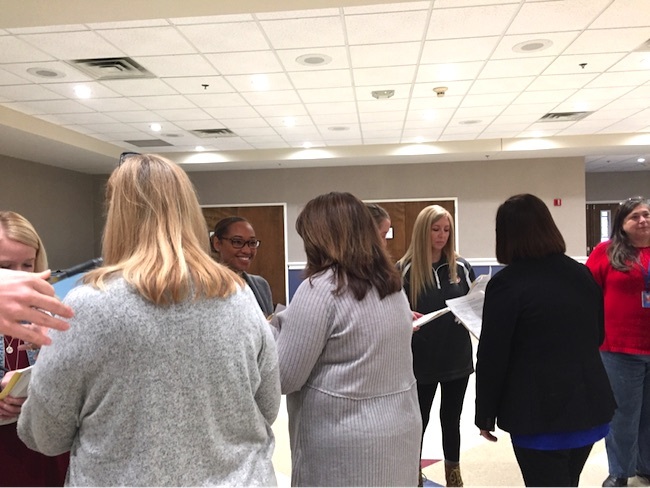 Pike Road and Madison City participants share how to “power-up” a lesson to more deeply engage students in learning. An example of a powerful task created by teachers from Florence City. 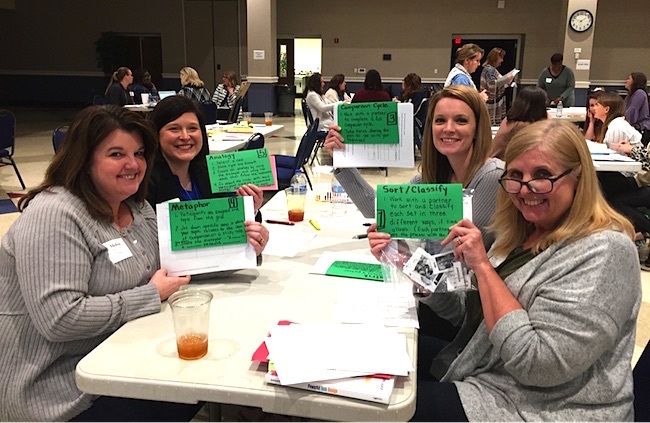 Tuscaloosa County instructional partners and Tuscaloosa Inservice Center Director Holly Morgan share an ELA “powered-up” lesson. While my week of travels didn’t involve airplanes or visits to different countries, it was completely and joyfully filled with learning, celebrations, and networking. And stay tuned: Who knows what comes next?! 0 Comments on "Cathy’s Travels: “If It’s Tuesday, This Must Be Oxford City!”"